Jobe’s Organics Blood Meal Granular is the easy and natural way to provide green, leafy vegetable plants, ornamentals, trees and shrubs with the extra organic nitrogen they need to produce healthy and lush, green foliage. 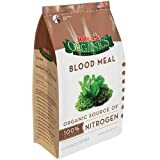 Made from 100% organic blood meal, Jobe’s Organics Blood Meal formula is approved for organic gardening. Please note blood meal is not recommended for peas, beans, or other legumes. Great for nitrogen hungry plants like green, leafy vegetables, ferns and shrubs. Jobe’s Organics Blood Meal with nitrogen is ideal for balancing nutrients in compost piles. Healthy plants start with healthy soil. Jobe’s Organics soil amendments will help you create the perfect growing environment for your plants. We recommend doing a soil test before using any soil amendments. Don’t miss out on these other Jobe’s Organics soil amendments: Jobe’s Organics Garden Lime, Jobe’s Organics Bone Meal, Jobe’s Organics Soil Acidifier, Jobe’s Organics Sphagnum Peat Moss, Jobe’s Organics Perlite and Jobe’s Organics Compost Starter. —Jobe’s Organics Blood Meal will help your organic garden thrive. Safe for use around children and pets.